The most powerful portable generator on the market is an exceptional value. Powerful enough to start many five-ton air conditioning units and can provide power for up to 16 circuits. 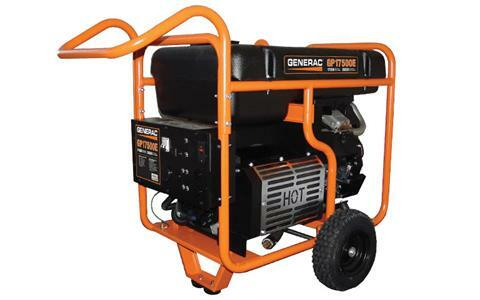 THE GENERAC OHVI® ENGINE: Incorporates full pressure lubrication with automatic style spin on oil filter for longer life engine. LOW-OIL PRESSURE: Shutdown automatically safeguards engine from damage. LARGE-CAPACITY FUEL TANK: With incorporated fuel gauge provides durability and extended run times. HARDENED 1 1/4 IN. STEEL TUBE CRADLE: For added strength and durability. HEAVY-DUTY, PNEUMATIC WHEELS: For reliable portability. ELECTRIC START: Battery included, provides hassle free start-up. IDLE CONTROL: Reduces noise and conserves fuel for extended run-times. INTEGRATED LIFTING EYE: For easy transport and security on the job site.